Whew. After a few really crazy weeks, I finally have time to catch my breath and post a few pictures of my latest projects. With a lot of kid activities and back-to-school stuff happening right now, my yarn is all that’s keeping me sane! So this is a photo-heavy post–I need a lot of help to stay sane right now. 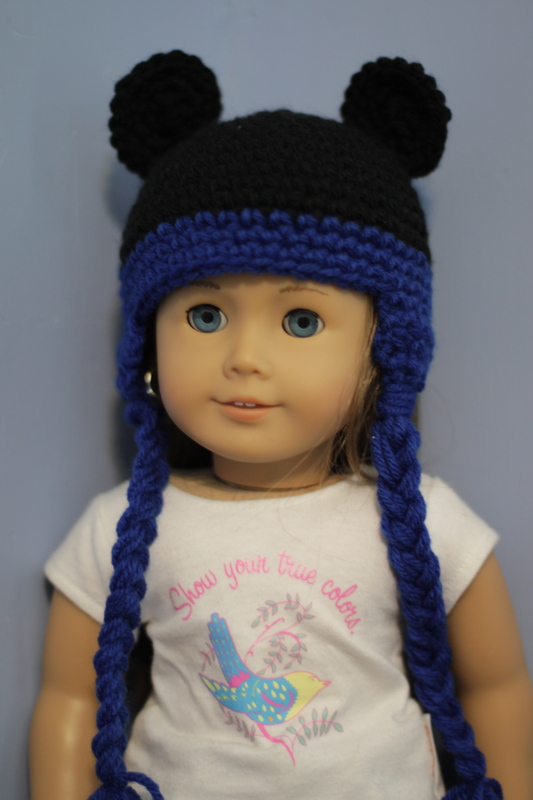 I had another request for girl/doll hats, but this time in blue. After that, I had another set to make, but it was a little trickier. 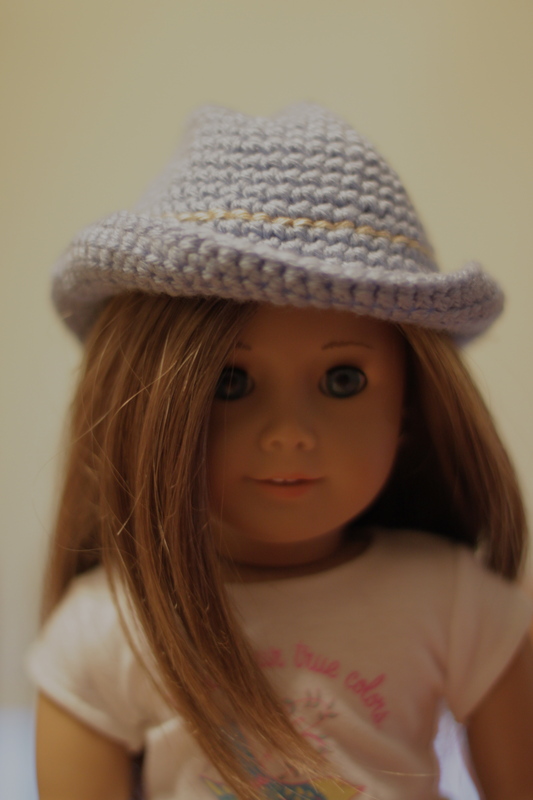 She wanted the cowboy style (only more like a fedora) but she wanted it for a girl and doll, and before I’d only made that style in the doll size. I searched for a good pattern, and went through three of them and wasn’t happy with any of them. I even bought a pattern! But they were all wrong in some way. Either they were too small or the wrong shape or they were too floppy. 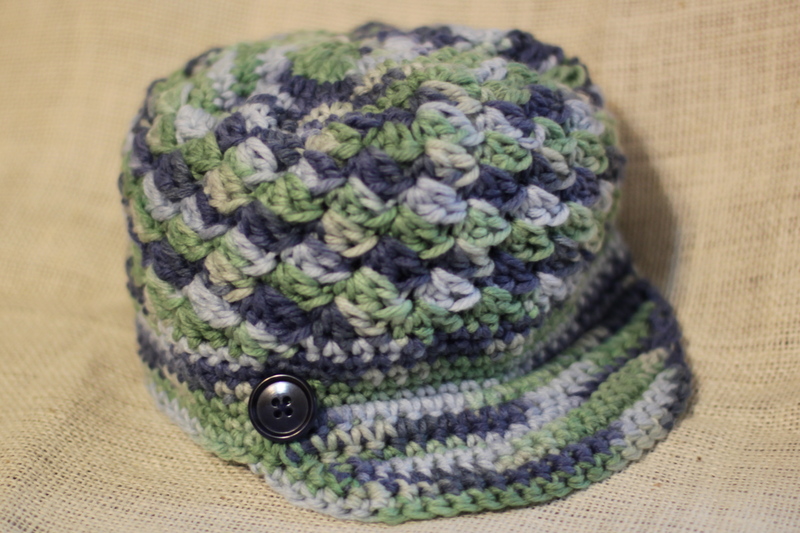 Finally, I went back to the original hat pattern and modified it to fit a child. (*fingers crossed* She hasn’t received the hats yet.) I doubled the yarn, went up two hook sizes, and kept increasing by about 20 stitches. I do like how it came out; it’s soft but still holds a shape somewhat. I just hope I made it deep enough for her head. If not, I’ll be making another attempt! 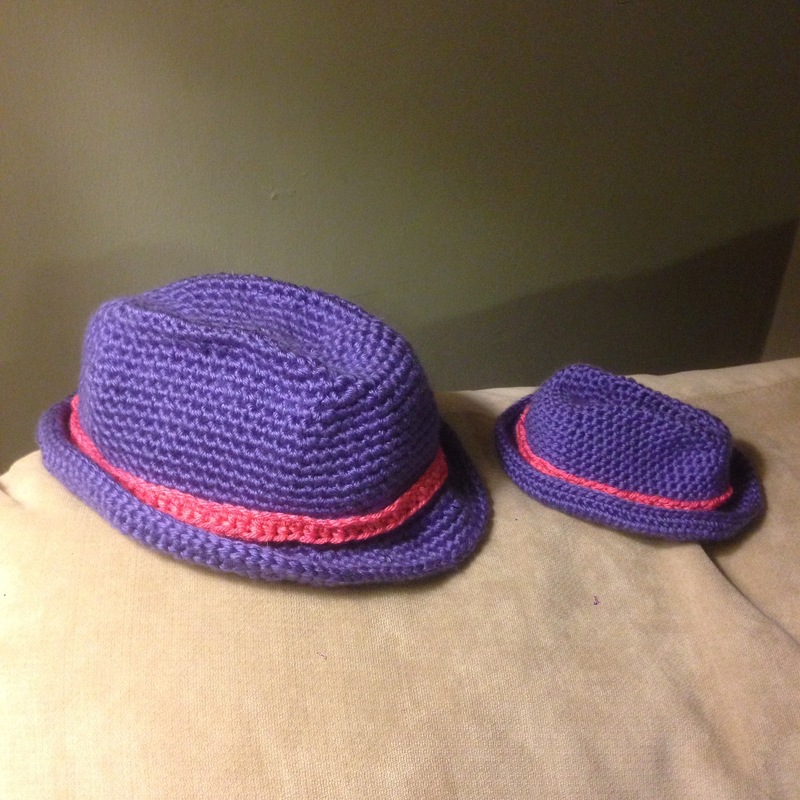 We celebrated my niece’s birthday this weekend, and I got to make her a couple of things too. 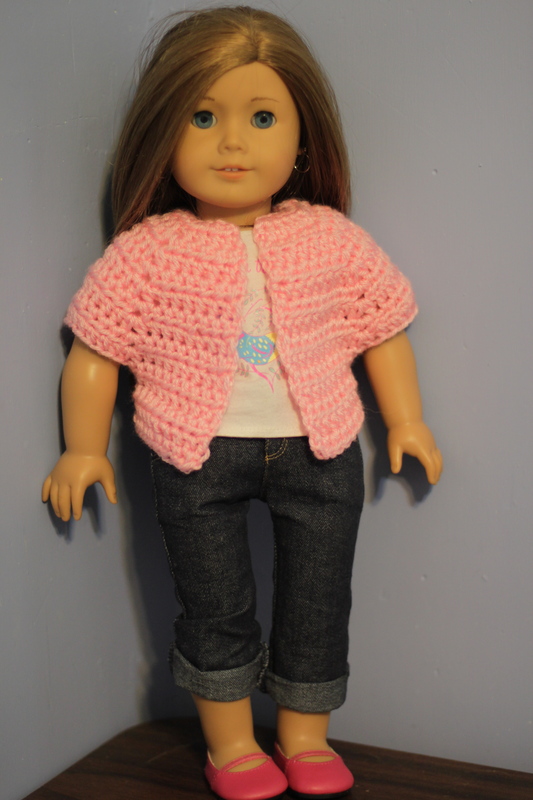 She loves stuffed animals, so I crocheted a little cardigan for her Hello Kitty doll to wear. It went so fast, and it’s super cute. I also made her a hat of her own. She’d seen me making the purple one, and kept telling me how much she liked it, so I worked up a blue version for her. 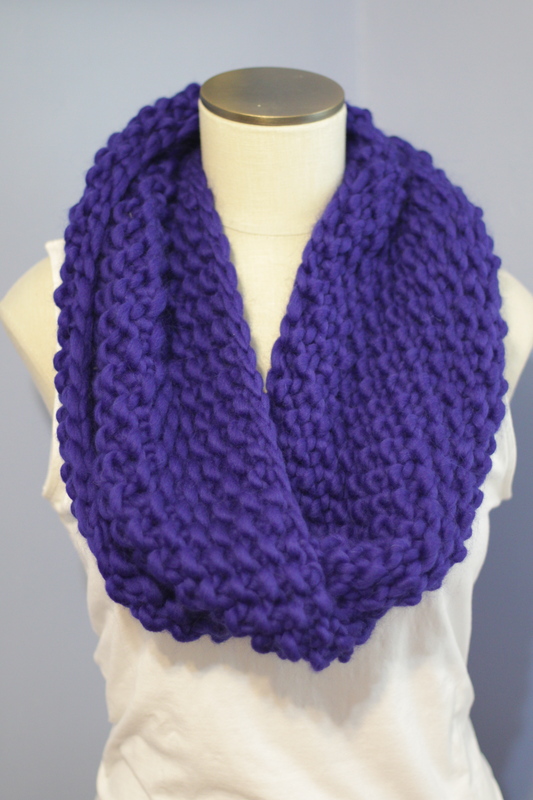 I used a single strand of a bulky yarn, with some wool instead of all acrylic, and I wasn’t happy with the end result. It came out floppier than I wanted, and today I discovered that it’s too small for her. 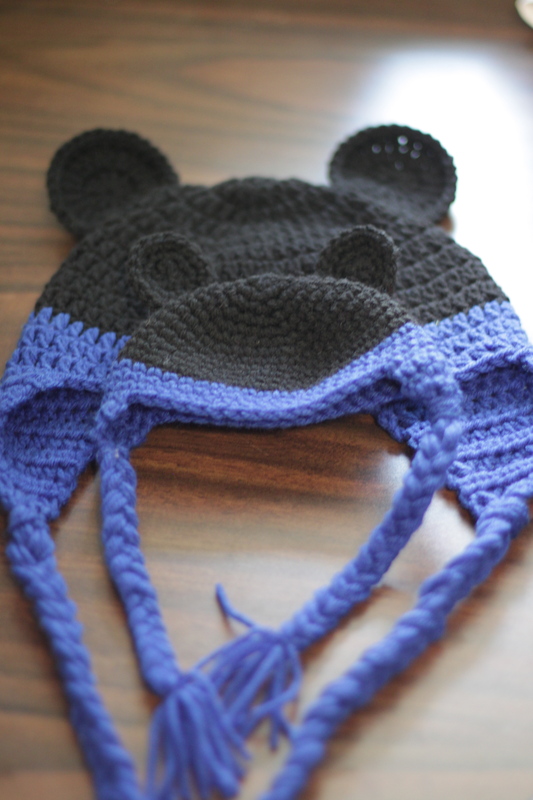 (*insert sad face here*) However, it looks adorable on my nephew, so I might just make another, bigger one for her. Finally, I was done with all those hats! With no pressing yarny needs and a sore wrist from crocheting, it was time for fat yarn and knitting needles. 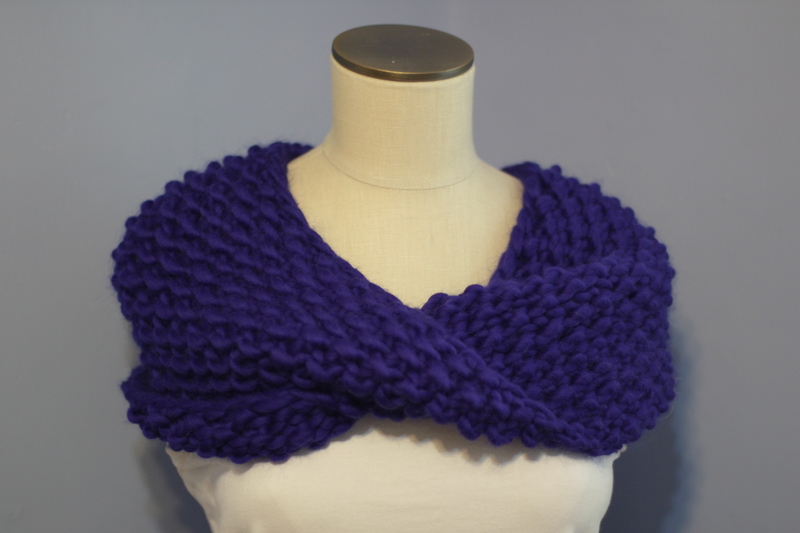 I picked up my indigo Cascade Magnum and my size 19 needles and made a Marian twisted cowl. I think that’s all. Ok, not really, I also made an adorable Christmas present but can’t show it off yet. Darn it. I do love it, too. 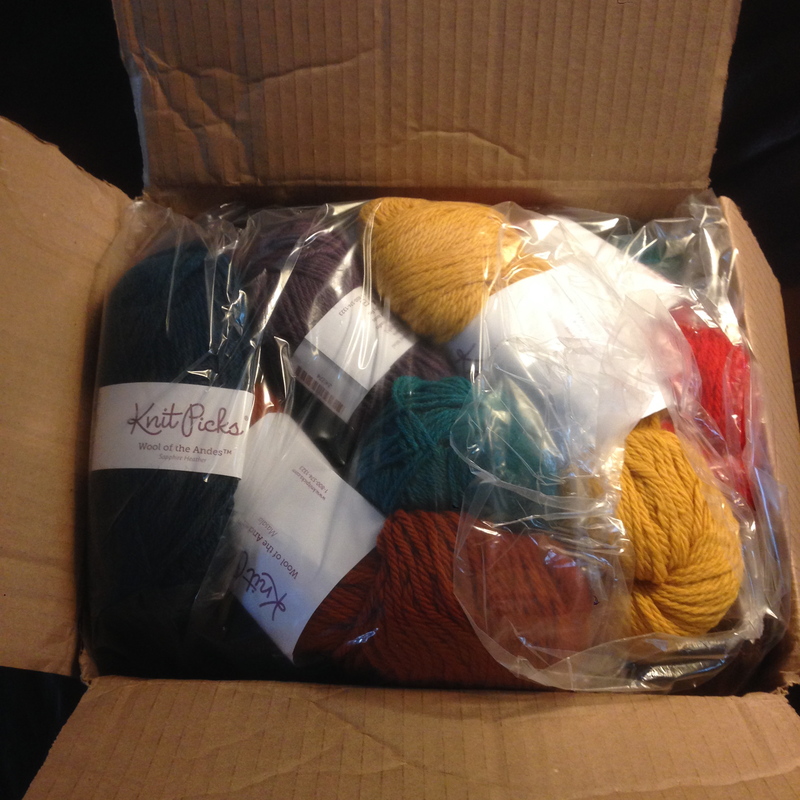 And now I think I will be working on some more Christmas presents because I ordered a bunch of stuff in the Knitpicks summer sale and I have this fun box of yarn to play with now! The hats have arrived so I can finally share some photos with you! 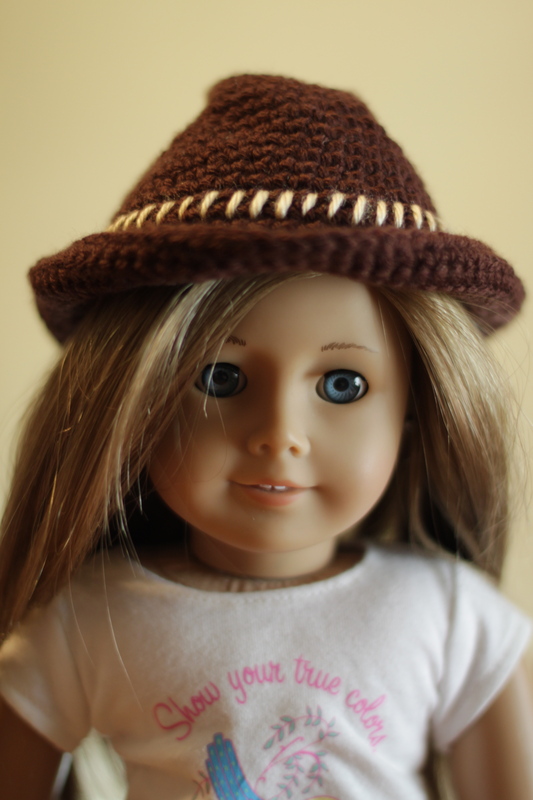 I made three sets of hats for a girl and her doll, and two sets of cowboy hats and boots for the dolls. I started with the doll hats while I waited for measurements. I found a great pattern by Carol Ballard on Ravelry here and she’s also got a blog called Cobbler’s Cabin. The first hat went quickly. It was awfully cute, even though the family thought it looked more like a fedora than a cowboy hat. With some shaping and tacking, I got it to look pretty close to a cowboy hat, I think. The boots were tricky. 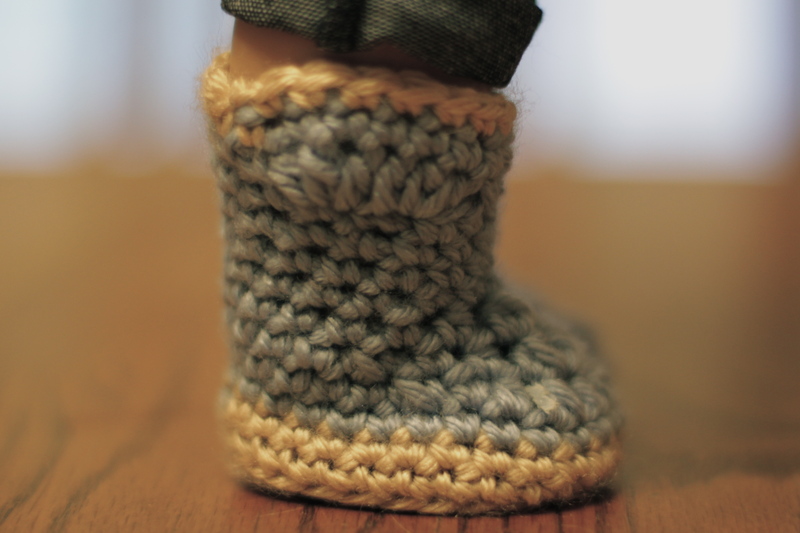 I used a Lion Brand pattern for baby cowboy booties, thinking that surely it wouldn’t be too hard to modify for a doll size. Ha! 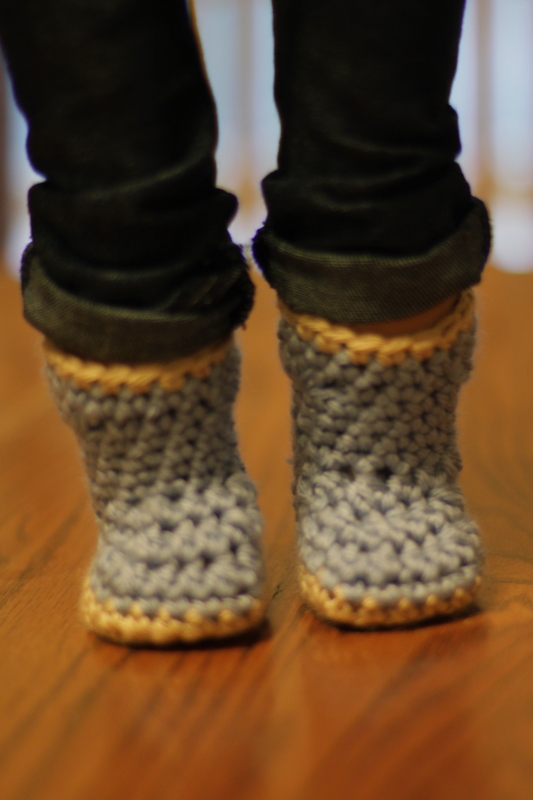 I crocheted and frogged the first boot at least three times while I figured out the right stitch counts. I finally got a good pattern and after that, the boots flew off the hook…until I got to the brown and tan pair. Brown was the requested color, but I used more on the hat than I expected, so I had just a tiny ball left for the boots. I tried to crochet as fast as possible, but it didn’t work, and I still ran out of yarn too quickly. The second boot didn’t match the first, and I am just OCD enough that it bothered me a lot. First boot was frogged and redone, and I finished the second with brown yarn to spare. 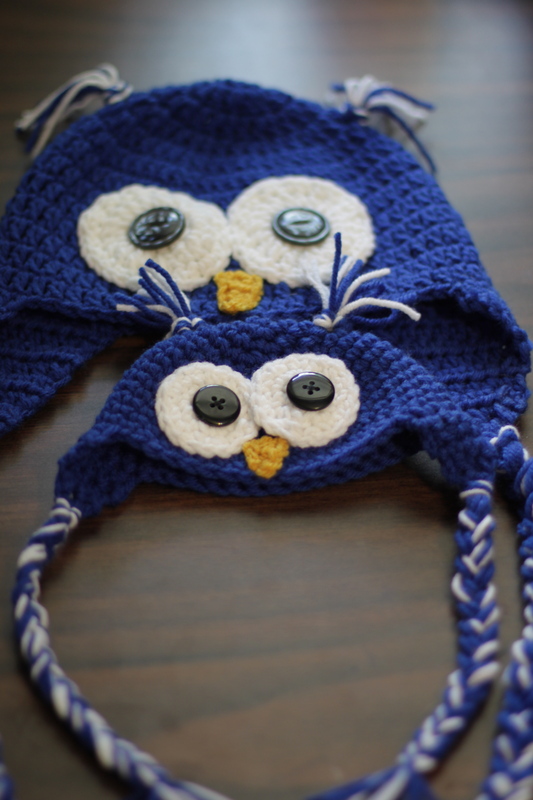 Owl hats were next. 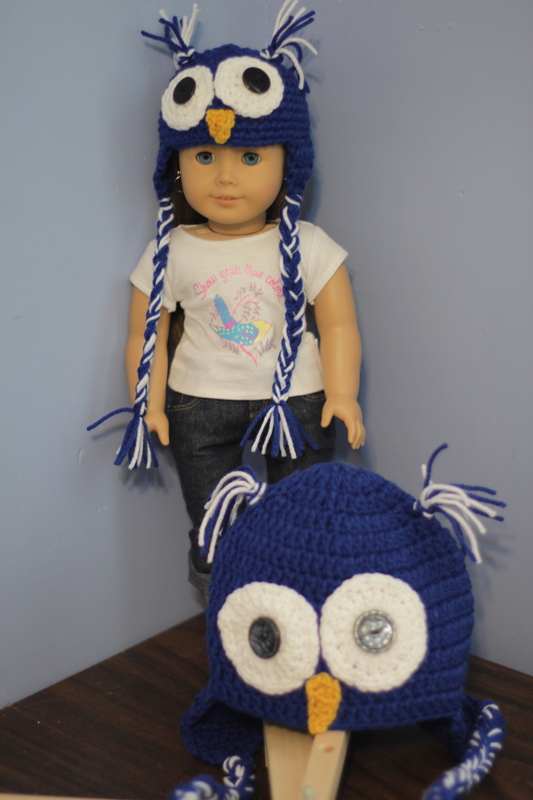 I found this great pattern by Kathy Russell for the doll size, and I had a blast making up the little eyes and beak and the little tufty ears. Plus I love buttons, so getting to add button eyes was a treat. 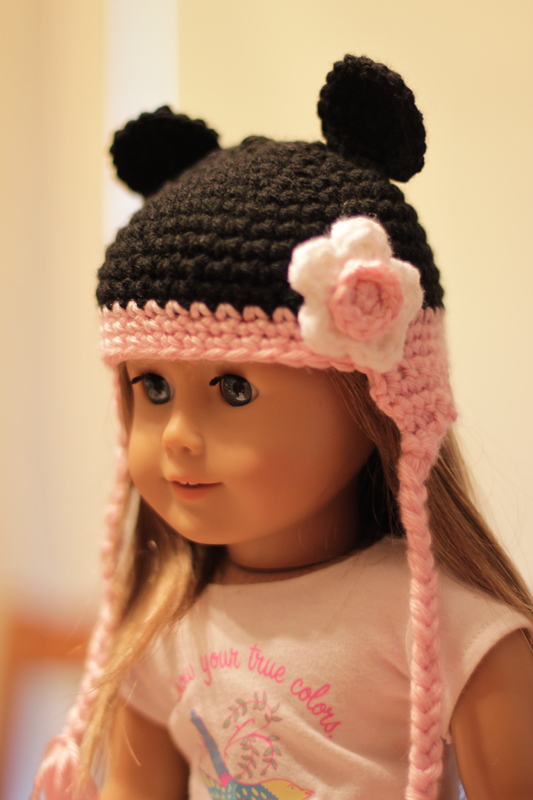 The girl size was done using an awesome pattern by Sarah at the Repeat Crafter Me blog. She does some super cute stuff, and this hat is so cool. 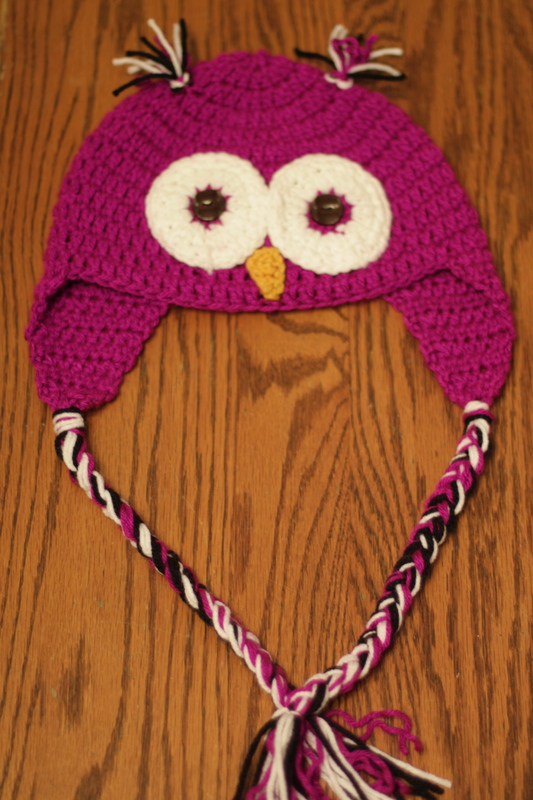 So easy to modify for size or design, you can make any kind of hat you want! 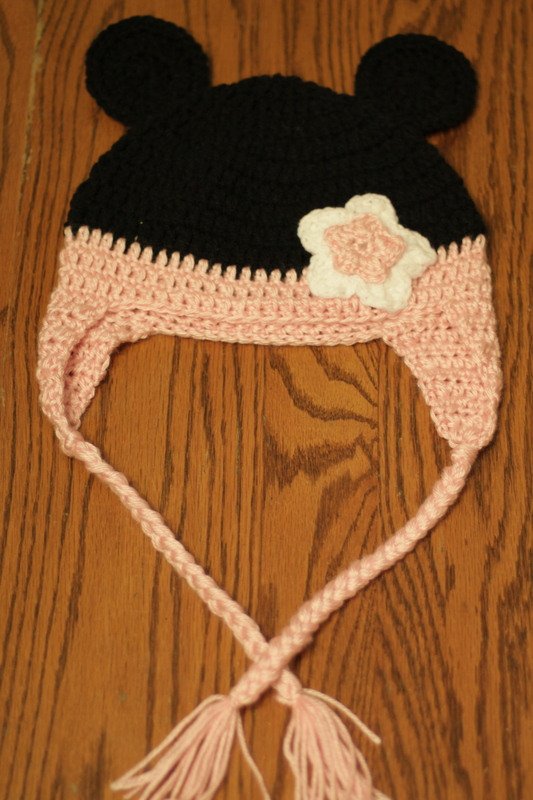 I used the same patterns for the Minnie Mouse hats, adding round ears and a flower instead of a face. Almost done! 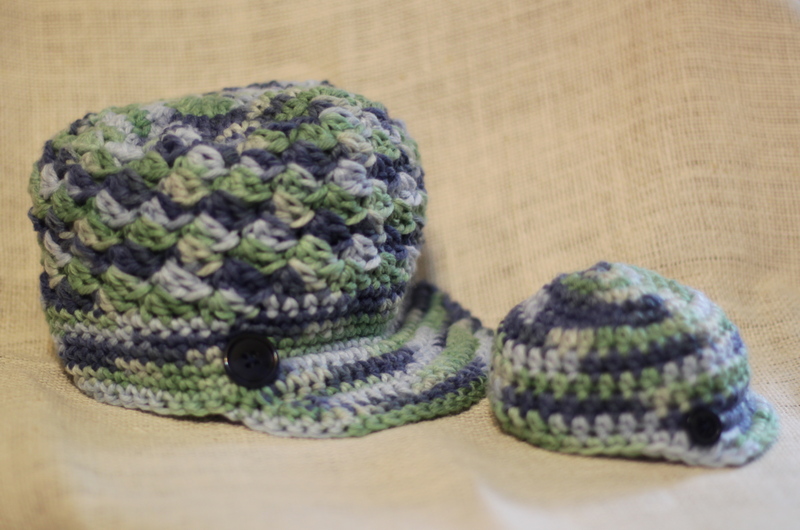 The last request was for a set of newsboy caps in blue-green. I found some great yarn at Michaels and a couple of great patterns to go with it. The doll pattern came from Posh Patterns, and you can find plenty more of her patterns on her Etsy site. The last hat ended up being my very favorite. The yarn worked perfectly with the pattern, and the sizing was great, and it’s just as cute as can be. The pattern is called Newsie by Heidi Yates, and she includes a handy size chart in the pattern so you can easily modify the pattern for sizes from newborn to adult. 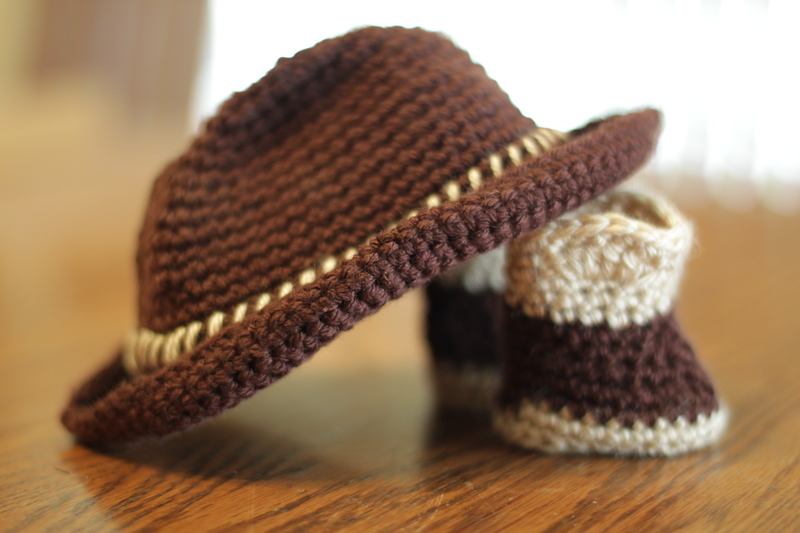 It’s the same pattern I used for my Tart Newsboy. All the hats fit their girls well and were a huge hit. She’s already asked for two more sets, so I’ll have more to show soon. 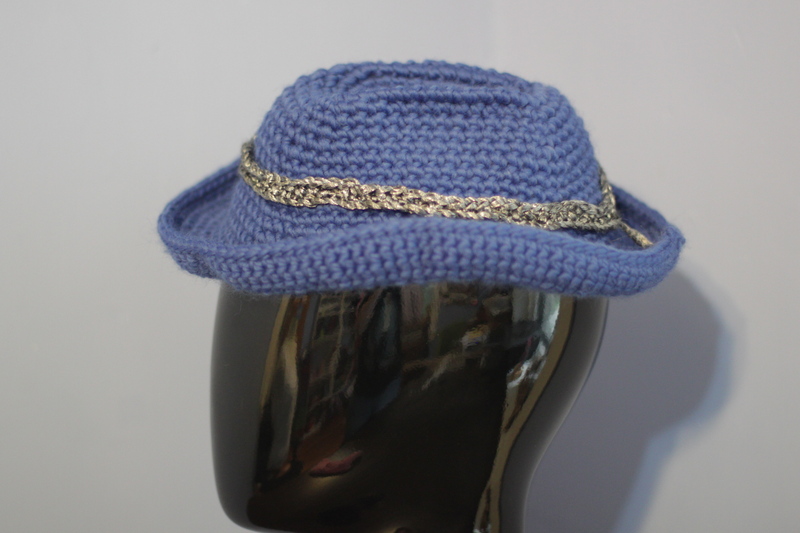 I hope I’ve inspired you to start hooking your own wee hats, but if you’d rather, I’d love to do it for you! Visit me on Facebook and send me a message. 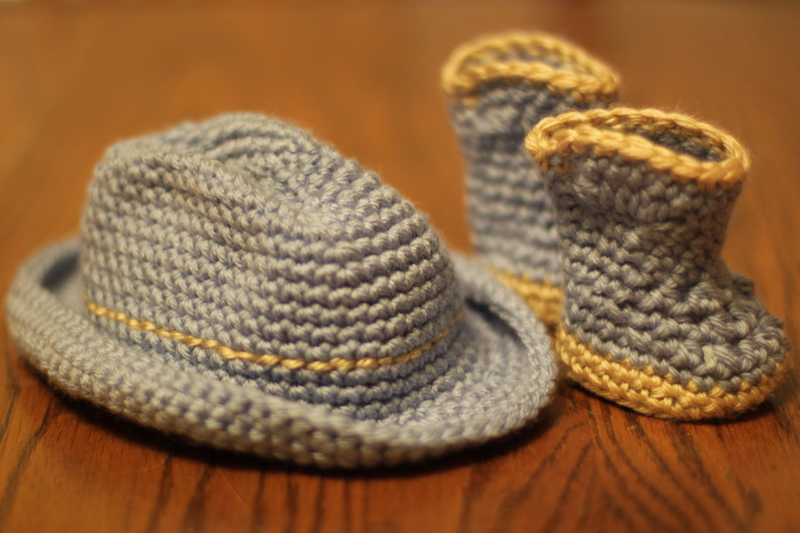 I got to do something new the last several days: make crochet doll hats and boots! 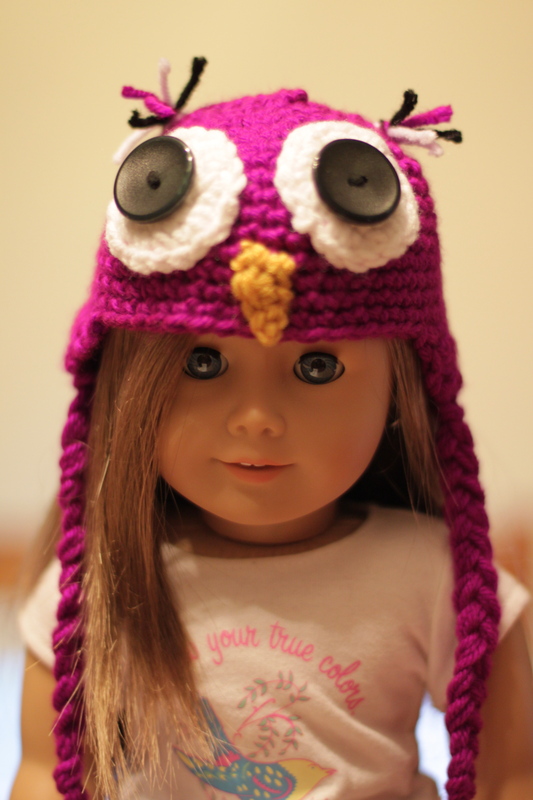 A friend of mine has two beautiful little girls, and those girls wanted some hats for their American Girl dolls. Since my daughter is too old for dolls (and never played with them anyway) and my nieces aren’t doll fans either, this was a challenge for me. I wasn’t sure I’d enjoy it, since I knew there’d be some fussy work with the little details and sewing things on and such. To my surprise, though, I really did like making them. Mostly because they went so fast, but also partly because they’re so cute when they’re done! I can’t show them all, because I want my friend to see them first, but she’s seen these pieces so I’ll post them. 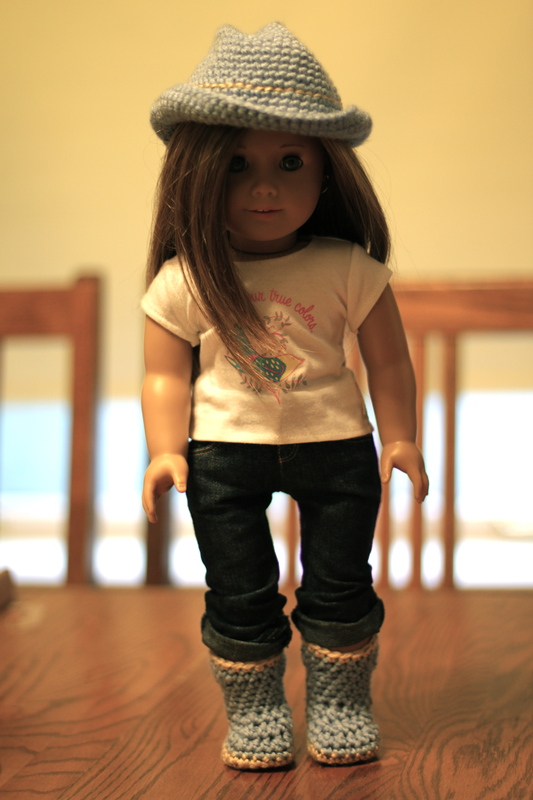 She asked for a cowboy hat and boots for the dolls. 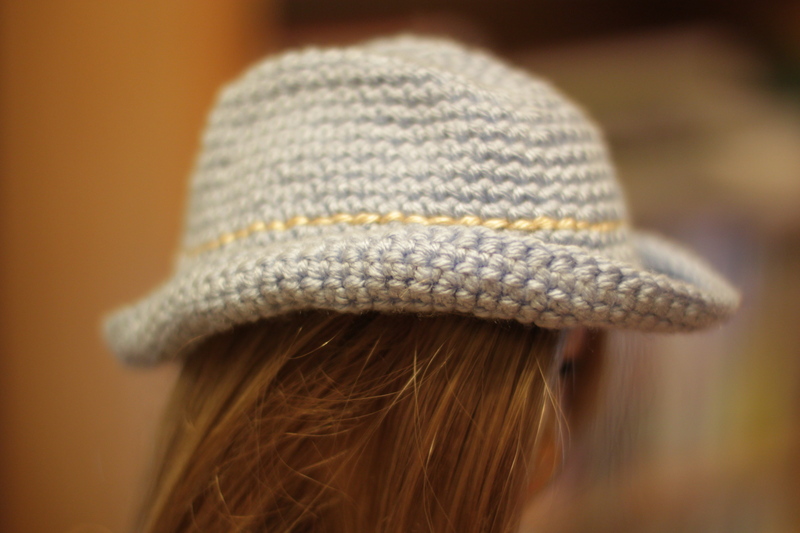 The hat was pretty simple; there’s a good pattern on Ravelry for it here. 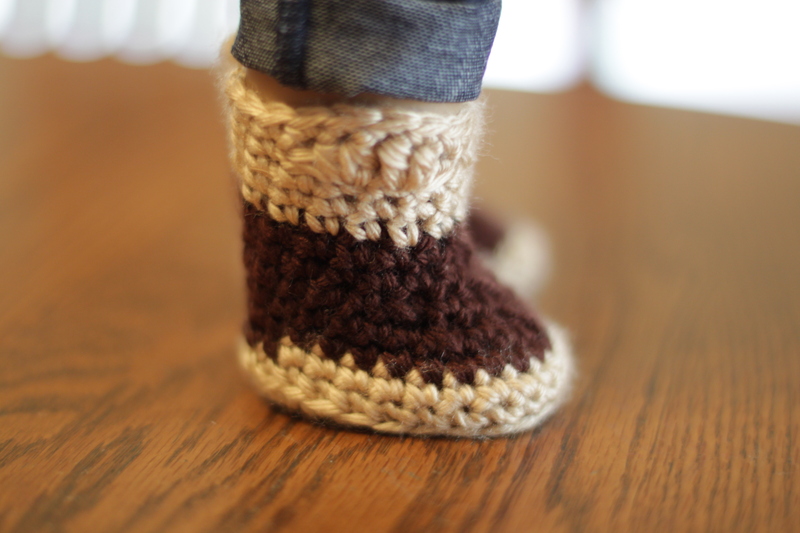 The boots were trickier though, because I took a Lion Brand baby bootie pattern and modified it. I’m pleased with how they came out.